Not quite sure if it is actually British, but it surely isn’t a Belgian classic! I discovered this cake on my visits to London and became a big fan, so it was about time to give it a go. I decided to try Rachel Allen‘s recipe from her cookbook Bake which seemed to use most of the ingredients I expected to find in it. Preheat the oven to 150 C and line a loaf tin with greaseproof paper. Beat 2 eggs in a large bowl, then add 140 ml vegetable oil, 200 g soft brown sugar, 300 grated carrots, 100 g raisins and 75 g chopped nuts (use pecans or walnuts, or leave them out if you’re not a fan). Now add the dry ingredients: 180 g self-raising flour, a pinch of salt, 1/2 tsp bicarbonate of soda, 1 tsp ground cinnamon, 1/2 tsp freshly grated nutmeg and 1/2 tsp mixed spice and mix with a wooden or metal spoon to bring the mixture together. Pour the mixture in the prepared loaf tin and bake in the oven for 1 h – 1h15 until a skewer inserted in the middle comes out clean. Allow to cool in the tin for 5 min before turning onto a wire rack to cool completely. You can already serve it like this, or you can add a layer of cream cheese icing. For the icing, beat 250 g cream cheese (straight from the fridge) and 50 g softened butter in a bowl until combined. Add 1 tsp vanilla extract, 275 g icing sugar and the zest of 1 orange and mix to combine. The icing should be smooth and quite thick. Make sure the butter is softened by leaving it a room temperature for a while. This time, don’t soften it in the microwave, because it will be slightly melted which is too soft. Also, this is the recipe if you use regular cream cheese (like philadelphia), which has a good consistency. If, like me, you decide to go for a tastier option by using De Brabander (by Campina) cheese, only use half the amount stated in the recipe because it’s quite runny. I’m talking from experience here, my icing ran faster then Usain Bolt! If yours is too runny, just put it in the fridge for a while to stiffen. If that doesn’t work, add more icing sugar until you reach the right consistency (you may want to add a squeeze of lemon juice as well). If, on the other hand, yours is too hard, don’t be tempted to loosen it with water or more cheese. Just dip your knife in a bowl of hot water before spreading it out. Enjoy! I’m always surprised that this is such a big hit because it just so easy to make! Even grown ups get a twinkle in their eye when I opened my box at work recently (I made them for my birthday). Some colleagues seemed to have so many questions they had to come and personally ask me that day… Needless to say, I only took an empty box back home! 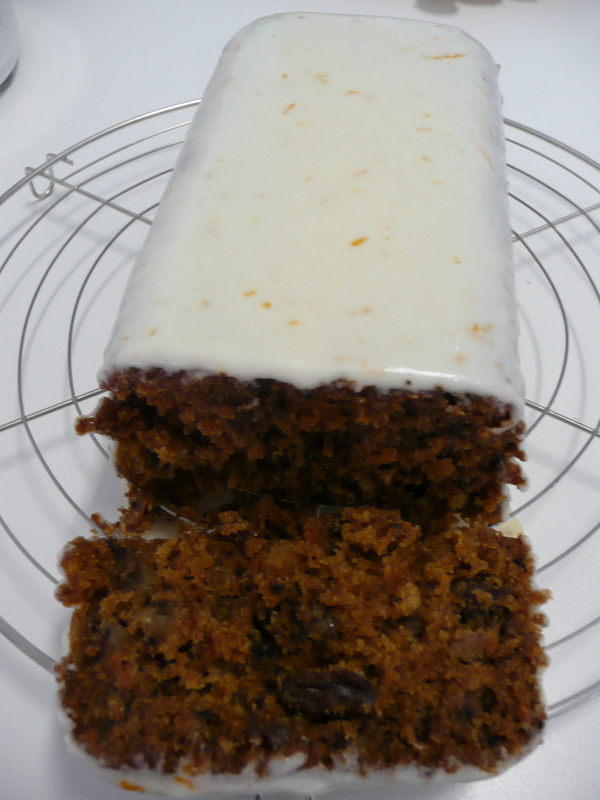 This is again one of my trusted GoodFood recipes, this time I got it from one of their small books, 101 cakes & bakes. 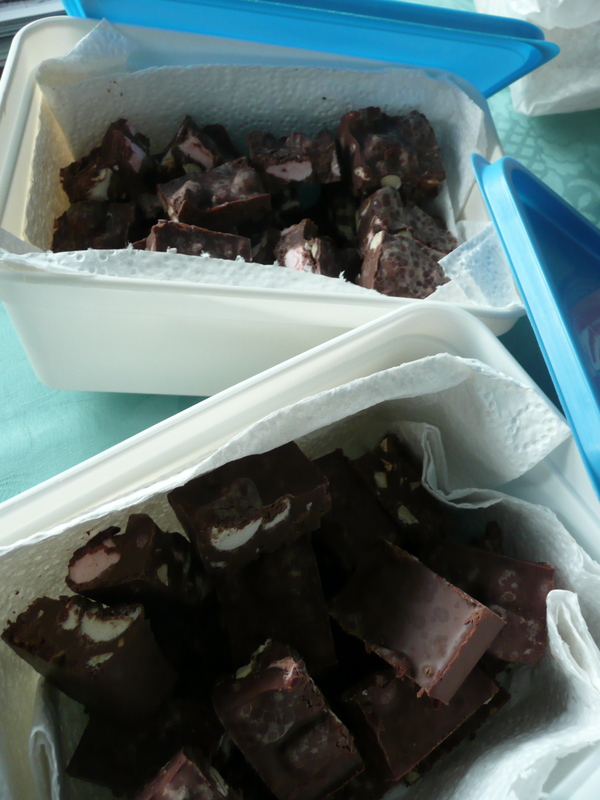 Line a 20 cm square tin with baking paper (if you don’t have a square tin, you can also make one yourself out of tin foil – or you can buy Lakeland’s Parchment Lined Foil, I’ve just bought it and already I’m a big fan!). In a heatproof bowl set over a pan of simmering water (aka “au bain marie”), gently melt 500 g milk or dark chocolate, broken into pieces. Then stir in 10 marshmallows cut into small pieces and 85 g roughly chopped mixed nuts (pecans, almonds or walnuts will all do as well). Pour the mixture into the tin and smooth the top. Leave to set for at least 2 hours (or overnight) before cutting it into 2.5 cm squares. To get a smooth and easy cut, just dip a sharp knife in hot water and wipe it, the heat will make it much easier to cut the squares. Trust me, this chewy, crunchy bite will be an instant hit anywhere… Enjoy!